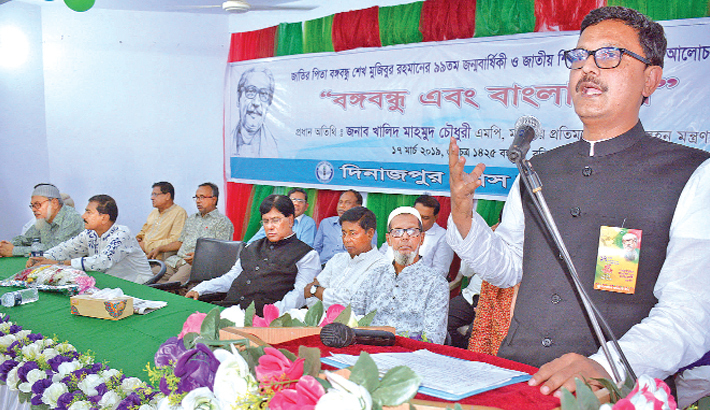 DINAJPUR: Awami League Organizing Secretary and State Minister for Shipping Khalid Mahmud Chowdhury on Monday said the role of the Upazila Parishad is very important to ensure the facilities and right of the local people, reports BSS. “The role of the Upazila Parishad is pivotal to strengthening the local government and also to ensure the facilities and rights of the people at the local level,” the state minister said this to the newsmen after exercising his voting right at Dantala Government Primary School of Bochaganj upazila here. The government wants that the people would elect the qualified candidates through the peaceful uapzila election, the state minister told the journalist. In Dinajpur, the people are exercising their voting rights at 663 poling centers of 12 upazilas—where 30 for chairman, 50 for vice-chairman and 47 candidates are contesting for women vice-chairman posts. Some 11,000 members from the law-enforcing agencies have been deployed at 12 upazilas in the district for holding upazila elections peacefully. Besides, members from Border Guard Bangladesh (BGB) are also patrolling the area as the striking force and 31 magistrates have also been appointed to this end.